Do You Take Small Cases Too? What’s Involved in a Claim/lawsuit? What is The Average Settlement Value For a Dog Bite Case? What if I’m Close To the Dog’s Owner? Do I Have To Sue the Owner? What if I’m Friends With the Owner? Can an Attorney Help Get Me Access to Medical Treatment? Who Covers the Injured Person’s Losses? Is it Possible For Anyone Else to Be Responsible? What Types of Losses Can an Injured Person Recover? How Long Before My Dog Bite Case is Over? How Can I Protect My Children From Dog Bites and Attacks? How Can I Prevent the Dog From Attacking Again? What is Considered a Dog Bite Under the Law? What Are the California Laws Dealing With Dog Bites? What Happens To a Dog That Attacks Someone? What Should I Do About an Off-leash Dog? How Many Dog Bites Occur in the United States on Average Per Year? How Does a Dog Get Classified As Vicious In California? How Does a Dog Get Classified as Potentially Dangerous In California? Can an Apartment Manager Be Liable For a Dog Bite Attack? It’s common for people who suffer through a dog bite attack to have questions flood their minds in the aftermath of this traumatic incident. Many people simply want to be able to begin to process all of the information related to the situation so that they can decide on a path going forward. 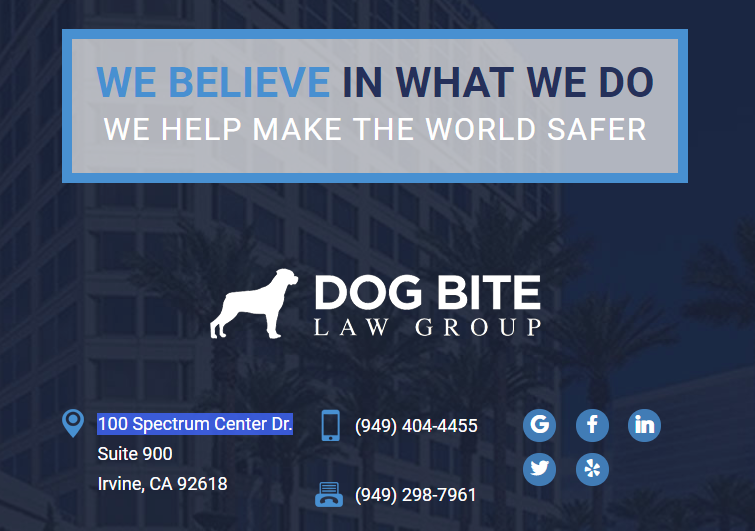 The best and most efficient way to avoid getting bogged down with a lot of different questions is to immediately seek the help of a California dog bite attorney from the Dog Bite Law Group. However, we understand that some may want to do some research on their own before taking that step. As such, we’d like to provide some general answers to some of the questions we’ve heard often over the years from the people we’ve helped to recover damages from those responsible for their dog bite attack injuries. If you have specific questions and/or you’re ready to take the next steps in the process, contact the firm today. If you’ve been bitten by a dog and are injured, then yes you have a case. Every dog bite situation is different in certain respects. They are all terrifying and traumatic, but in order to determine whether or not you have a case, you should seek the advice of a California dog bite lawyer. The Dog Bite Law Group offers free initial reviews, so you have nothing more to lose by obtaining some foundational advice that deals specifically with your situation. Every case is a bit different in terms of the losses suffered by your injuries and the recovery time, among other factors. There are several different types of financial recovery that can be pursued by way of a lawsuit, but a California dog bite attorney should help you make all of these determinations. Do You Take Small Cases Too? Severity Doesn’t Matter, Small Cases Too. Every loss is a real loss. No case is too small. We handle cases ranging from approximately $5,000 to more than $10 million. A California dog bite attorney should help you evaluate the potential value of your claim before you decide how to proceed. There are several steps that may need to be taken after a dog bite attack that will enforce the legal rights of someone who has been harmed. You’ll need to gather evidence, obtain medical help, make contact with the other side, attempt to negotiate a settlement and perhaps file the lawsuit. You should do all of this with the help of a dog bite attorney. Dog bite cases vary widely in terms of settlement amounts. That’s because every case is different, involving different injured parties, different injuries, different forms of past and future losses and the like. You should have an attorney evaluate your case to help you understand the potential value of your claim. In the majority of dog bite cases, the dog’s owner is responsible for injuries that are inflicted. However, there are also situations where landlords, others caring for the dog and still other parties could be responsible. Insurance companies can also play a role in these aftermaths. Is there insurance for dog bite attacks? Yes, there are many dog bite cases where the dog owner has some form of insurance coverage. However, the type and specifics of that coverage needs to be investigated and any settlement amount would need to be negotiated with that insurance company. That’s best handled by an attorney. Data from different sources reveal that a large number of dog bite attacks involve familiar dogs. This presents a problem for those who are injured, as no one wants to sue a friend or relative. However, and as stated above, that’s usually not necessary as long as there is insurance coverage. A claim can be filed and a California dog bite attorney can deal with negotiating a settlement before filing a lawsuit becomes necessary. In such situations, the friend or family member will not have to pay the damages. Do I Have to Sue the Owner? What if I’m Friends With the Owner? Will That Affect Our Relationship? Not every dog bite attack leads to a requirement to sue the dog’s owner. That’s a determination that should be made with the help of an experienced California dog bite lawyer. If a lawsuit is necessary, he or she will deal with the process for you, including communicating with the dog’s owner and any insurance company that’s involved. Sometimes, a settlement is seen as the best solution for everyone. You should hire a California dog bite attorney for many reasons if you face this situation. You want to make sure that you account for all of your losses and pursue their recovery. You want to make sure the other side understands that you’re serious about your legal rights. You also want to be sure that you’re making sound decisions as you move through the process. Yes, an experienced California dog bite attorney can help you find medical help to receive treatment for your injuries if for some reason you are unable to do so. Costs refer to what must be spent in order to move a lawsuit forward. Examples of costs include fees for documenting medical records, expert witness fees, court reporter fees and the like. The Dog Bite Law Group generally works on a contingency fee basis, which means that (a) your costs are covered and (b) you don’t pay us a fee unless we recover a settlement or a judgment for you. Speak to members of our firm for more details. Who Covers the Injured Person’s Losses After a Dog Bite Attack? Most of the time, when someone is injured in a dog bite attack, the dog’s owner is responsible for the losses incurred by the injured person. California is what is known as a “strict liability” state in this regard, meaning that the injured person does not have to prove that the owner was negligent in order to recover. He or she merely needs to prove that the owner owns the dog, the dog bit the injured person and that the attack caused injuries and damages. Is It Possible For Anyone Else To Be Responsible For a Dog Bite Attack? In limited situations, it is possible for someone other than the dog’s owner to be liable for damages following a dog bite attack. Someone who is “harboring” the dog at the time of an attack could be responsible, such as when someone is taking care of a dog while the owner is gone, or walking a dog at the time of the attack. There are also times when the landlord of a residential or commercial property could be liable for damages. What Types of Losses Can a Person Injured In a Dog Bite Attack Recover? Which specific types of damages are relevant to a particular situation will depend on what actually happened. What Is the Statute of Limitations in California Dog Bite Cases? The statute of limitations is the amount of time someone has to file a lawsuit. If someone attempts to file a lawsuit after that time limit has passed, it will be dismissed as a matter of law absent some provable exception. In California, the statute of limitations in these types of cases is two years from the date of the incident. There is really no way to determine how long a California dog bite case is going to take. For the most part, in situations where the injured party’s case is strong, it will settle out of court before ever getting to trial or even being filed at the courthouse. However, some cases do move all the way through the legal system. Some matters are resolved within weeks, while others can take months or longer depending on all the factors involved. If you have been bitten by a dog, you should make sure to identify the dog, the dog’s owner and anyone who may have been responsible for the care of the dog at the time of the bite. You should also seek immediate medical attention, as even dog bites that do not initially seem severe can become infected and lead to serious medical danger. There are many different injuries that commonly result from dog bite attacks. You can find a list here, but almost anything can go wrong when a dog sinks its teeth into a person’s tissue. Lacerations, infections, broken bones and the like are all common consequences of attacks. We recommend you review the list of recommendations published by the American Veterinary Medical Association and get to know them well. These recommendations could help you avoid a serious legal situation. You can find the list here. There is no way to guarantee that a dog that attacks someone will not attack someone again in the future, other than to prevent that dog from interacting with people altogether. If you or someone you love has been injured in this manner, you should make sure that the dog is reported and then classified as either potentially dangerous or vicious, as that will lead to restrictions for that dog going forward that limit its interaction with people. A dog does not necessarily have to “bite” someone in the literal sense in order for an attack to potentially give rise to legal liability. A dog could merely knock a person over and injure that person, cause a traffic accident or just about anything else that leads to serious harm. There are several laws that deal with dog bites in California, and you can find an overview of them here. Strict liability is a legal standard that basically states that you don’t need to prove negligence in a personal injury lawsuit in order for liability to attach. In dog bite cases, you need only prove that the defendant owned the dog, the dog bit you and that you suffered losses. California follows the strict liability standard in dog bite cases. That depends on what specifically happened during the dog attack and whether or not the dog at issue has any sort of history of bites. Dogs in California that bite or attack animals or people can be classified as potentially dangerous or vicious, and each classification leads to specific requirements. If you encounter a dog that’s not on its leash, you should remain calm. You should not approach it, and if it approaches you, avoid eye contact, cross your arms and attempt to ignore the dog. You can find a longer list of suggestions right here. The statistics regarding dog bite attacks in the United States are staggering to many who see them for the first time. Approximately 4.7 million dog bites occur in the United States alone every year. That’s nearly 400,000 dog bites per month, more than 12,800 per day and more than 536 every hour. California law states that a dog will be classified as vicious if it has severely injured or killed someone or attacked another animal or person more than twice during the previous three years. When a dog is classified as vicious, it severely limits its ability to be around people and domesticated animals in the future. California law classifies a dog as potentially dangerous if it has attacked a person or another animal twice within a three-year period or it’s bitten someone once and caused minor injuries. Unlike with vicious dogs, it is possible for a potentially dangerous dog to be removed from that registry. It’s possible for a property manager to be liable for a dog bite attack if the landlord rented to a tenant with a dog and at the time of the rental there was some dangerous condition, such as a hole in the fence, that was not removed. It’s also possible for a landlord to be liable for a dog bite if he or she is harboring the dog at the time of an attack. If you need more specific information, contact the California dog bite lawyers at the Dog Bite Law Group as soon as possible to schedule a free initial consultation.